​​HOUSTON AREA - Lone Star College System (LSCS) has increased tuition by $2 per credit hour amid rising student enrollment this semester. Funding from the state for the 2016-17 budget has not changed. 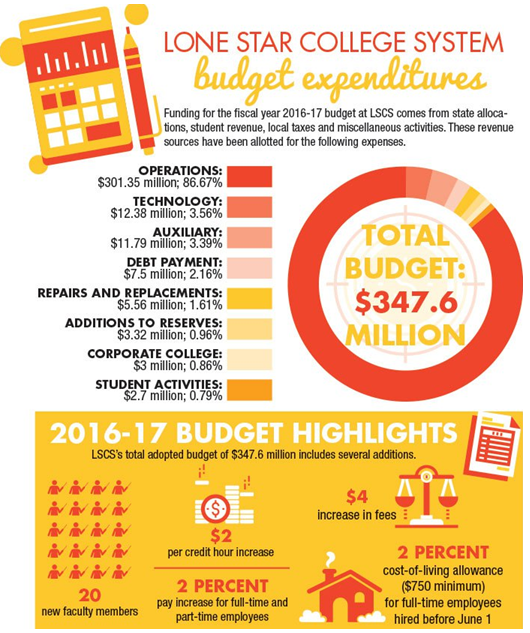 During an August 4 board meeting, the LSCS board of trustees approved a $347.7 million budget for the 2016-17 school year. A public hearing for the proposed tax rate of $10.78 per $100 of valuation will be held September 14 and 19. The board will make a final decision during the October 6 board meeting. In addition to the tuition increase, the budget includes a $4 per credit hour increase in differential fees. This semester, LSCS hired 20 new faculty members, and all full-time and part-time employees will receive a 2 percent pay increase, according to the adopted budget.